Day 11, NaWriMoPo, November challenge. No earth shattering news or thoughts today. It was all and all a pretty quiet day and after I got the kitchen tended to after breakfast, I was able to sneak down to the sewing room and work until noon on the quilt project. 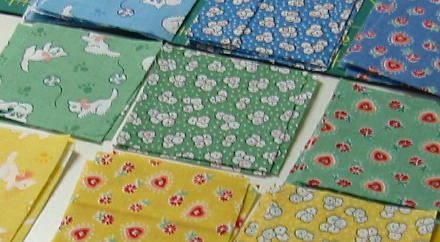 I cut a out the 2½ white squares that each of the printed squares shown below will be paired with and sewn into strips. Then I sorted out printed squares according to color family. Each one is 2½ inches square. It occurs to me that putting a quilt together like this is very much like putting a puzzle together and it’ll be easier if the fabric pieces stay put so you can see how it will look. A printed grid fabric has a special felt-like feel to it so that you can press all those small squares onto it so they’ll stay put while you get the colors sorted and placed the way you want them. After I pulled it out the basket drawer I’d stored it in long ago, I couldn’t help thinking I was working once again with my cat Bridget underfoot throughout the day for one more time. Lest I sound like a crazy old cat lady off her rocker, I’ll explain. At some point Bridget, dead now for about three years, must have crawled into a partially opened drawer and burrowed up on this soft fabric to take a lot of naps–probably when we first moved here and she was all out of sorts and confused because of the move. No matter when, she left bits of herself through all those black hairs she shed all over the portions of the fabric. I actually knew it was there but had forgotten. I found it originally not long after she died, you see, when I was getting my sewing room organized after Hubby and SIL finished out part of the laundry room for it, but hadn’t wanted to wash it at the time. Those hairs were all I had left of my cat family so I thought I’d wait and wash it some other day, when I was feeling less sentimental. Obviously I never got round to it. Today, there it was again, little black hairs that don’t want to let go. This time I didn’t want to take the time to wash it, nor chance washing away the soft finish that help the squares stay put. What else can I say?! Seeing all those black cat hairs brought back lots of nice memories of all the years I spent with my cats–all those times Hubby was away on business trips and it was just me and the cats–solid black Bridget and Blossom the Calico– the last good years of their lives although I didn’t know at the time. Curled up in my lap, they were my constant companions for close to seventeen years. Then when we came here they were old and the vet warned me the adjustment may prove too difficult for both of them. So anyway, the hair is still there, and when this quilt is done I’m ready to wash the fabric grid now. It’s time. And this is how the quilt project is coming along. After it’s all assembled, I’ll sew the squares together into strips, then sew the strips together, sandwich the quilt top with a nice printed backing, and hitch up the quilting stitch on the Bernina and try to figure out the best quilting pattern. The progress will be slow, but God willing and the creek don’t rise, it’ll be done someday. Today was Veterans Day, and I hope you remembered the veterans, and if you knew one personally gave them a hug. While I was working around the house I had my ear turned to some of the special services. Tomorrow, Hubby and I will be back at the gym early because snow is forecast, starting in the mountains as early as tonight perhaps. Thank goodness we got the studded snow tires mounted yesterday. Timing is everything. So if I don’t otherwise screw the day up somehow, I hope to have more time to write post #12, about the most expensive movie we never saw. In India we remember the heroes on 26th January. Your cat’s memories are lovely! Here I am, and good morning. Yes, we both should have the shot, but right now we don’t have the extra cash. This unemployment stuff pinches in corners little seen. Yes three, I flat out love those fabrics. What very happy depression era prints. Are you going to group them as in that tiny sketch you did….reds fading into blues et al? Beautiful materials but your cat hairs made me teary for my beautiful cat we left home with my daughter. I can’t wait to see her and hope she isn’t too mad at me!